Manchester Museum of Transport - lots of buses! Today we’re in Pendine, the tiny village in Wales where, in the 1920s, the World Land Speed Record was broken five times. Pendine was the chosen for the attempts because Brooklands, the huge banked track in Surrey, was becoming too small for the speeds being reached. 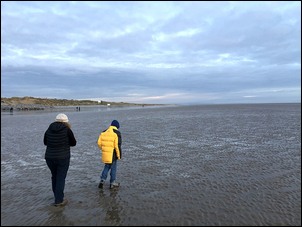 Pendine has a long flat beach, revealing at low tide an expanse of sand on which men – and they were all men – could travel as fast as they liked. So Malcolm Campbell came here first, in 1924. 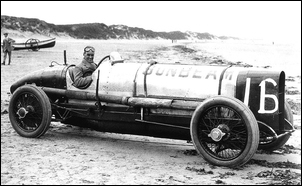 His Sunbeam reached a speed of 146.16 mph, making Campbell the fastest man in the world in a car. The next year he raised that to 150.87 mph, before the record was taken from him by Parry Thomas driving the tongue-in-cheek named ‘Babs’ to 169.30 mph. Thomas then lifted the speed to 171.02 mph, before, on March 3 1927, dying in an attempt to go even faster. His friends buried his car in the dunes behind the beach, and it stayed there for 42 years before being exhumed and restored. 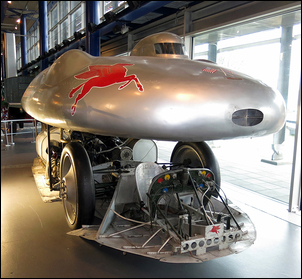 For half of the year it is on display at the Museum of Speed in Pendine, but in the midst of January winter, the museum is closed and empty – so we were unable to see the car of this hero. We’d come to Pendine not only to see the site of the Land Speed Records, but also to have three days in a tiny village not dissimilar to the hamlet we live in in Australia. And Pendine is tiny. In summer, I imagine the caravan park full, the tourist shops bustling. But at this time of year, a few people on the beach playing with a dog is all the life that can be mustered…. 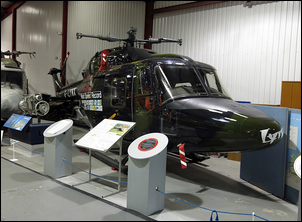 The day before coming here, we’d visited the helicopter museum in Weston-super-Mare. Billed as the world’s largest dedicated helicopter museum, it’s another of these volunteer-run places chronically short on space but with a wonderful collection. 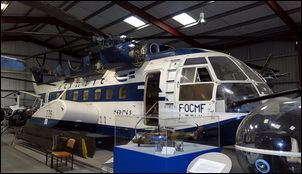 There’s the current world speed record holder for helicopters (a modified Lynx); an example of the previous speed record holder – the Russian Hind gunship; an enormous Sud SA321F Super Frelon that, with its 37 passenger seats, is more like an airliner than a helicopter; and all that remains of a machine that has long fascinated me – the 1950s Fairey Rotodyne, a machine that could fly as either a gyrocopter or helicopter, the lift blades able to be powered by jets placed at the tips of the rotor! This museum is not particularly flash in presentation but if you’re interested in aircraft, there’s certainly plenty to keep you entranced for an hour or so. Yesterday we went on a drive around some of south-west Wales. 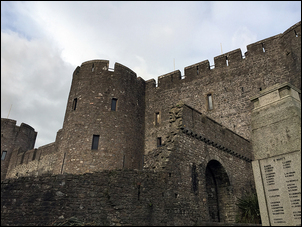 We went to Pembroke, Pembroke Dock and Milford Haven. As we noticed when driving here from Bristol, parts of Wales are the sites of large, traditional and (apparently) polluting industries. At Port Talbot, there’s one of Europe’s largest steel works (it’s the biggest employer in Wales), with multiple smokestacks belching into the sky. Apparently, there’s also a chemical works nearby. At Pembroke Dock there’s a large oil refinery, oil tankers lined up under the gaze of the town. We were surprised by the close proximity of the industrial complexes to the towns. In fact, it was apparently once even worse: in 1992, Texaco bought (and then demolished) the entire village of Rhoscrowther, which was immediately adjacent to the Pembroke Dock refinery. Considering how close the current town is, Rhoscrowther must have been right against the fence! At Pembroke we went on a tour of Pembroke Castle. Having never been in a genuine castle before, it was interesting looking at the fortifications and general internal structure. However, knowing nothing of the medieval history of Britain, the recreated tableaus and signage meant zero to me. Leaving Pendine, we did the long drive to the north of Wales. On the map it actually looks quite a short drive, but the roads are poor – very narrow and tightly winding. Pretty scenery, but especially in a large car like the Jaguar, a demanding drive. 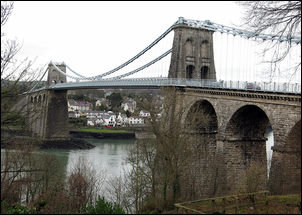 A full half-day later, we were at the site of Thomas Telford’s superb Menai Strait suspension bridge. 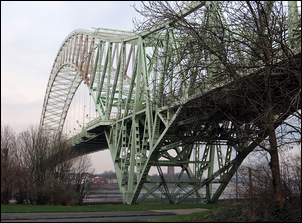 The bridge dates back to an incredible 1826, and while the original deck has been upgraded, and the suspension chains altered from iron to steel, the shape and feel of the bridge is as it was 190 years ago. We walked the bridge – it’s impressive now and must have been truly extraordinary then. We’re now in Liverpool, where we’ve spent a few days. We had intending staying here only one day but we’ve been impressed by this city. In its architecture and urban geography, its past as a booming port is readily apparent, and the marvellous buildings in and around the city centre shows a mid-19th century wealth seen by few British cities. 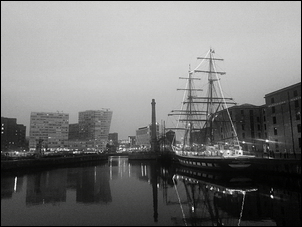 The Liverpool city museum and the maritime museum are both excellent, the city museum in particular showing how effective a museum can be when it tackles the social, geographical and technological historical threads of a single location. Compared to our visit to the UK three years ago, the country looks in better shape. Urban renewal is occurring and I particularly like the knack of integrating the old and the new in harmony. In Liverpool that’s been done in the inner-city docks area (the sites of the aforementioned museums), in the use of an old façade that sites apartments just outside the CBD, and in the proposed use of the Littlewoods building – one of the best art deco industrial 1930s buildings you’ll ever see. While in Liverpool, we also visited the Silver Jubilee bridge, located a little out of the city. This is a steel arch bridge, built in the 1950s, that looks very much like a shrunken Sydney Harbour Bridge. Oddly for a 1950s bridge, it uses much the same construction method as the Sydney bridge, with a fully riveted design. Still, a very elegant bridge indeed. 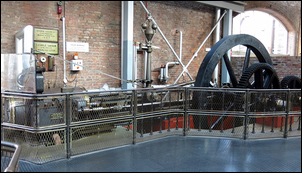 Yesterday we went to the Manchester Museum of Science and Industry. The website undersells this museum quite a lot; we were unsure of what to expect but in fact were pleasantly surprised. There is a quite fabulous collection of large stationary engines; fascinating technological history of Manchester (the city used to use a high-pressure system to provide hydraulic power to numerous customers); and a great display of weaving loom machinery. I particularly liked the Beyer Garret steam locomotive on display – its unorthodoxy very apparent. 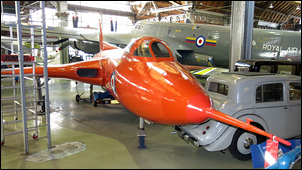 The aircraft section was also unexpectedly good, with the orange Avro 707A experimental aircraft (designed to test features of the upcoming Vulcan) my favourite. 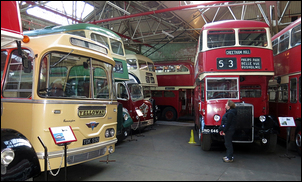 Next stop was the Manchester museum of transport – a museum devoted to buses. We had a great time here! It’s a volunteer museum short on space but high on enthusiasm and wonderful exhibits. My son Alexander and I were able to climb to the top deck on many of the double decker buses, get into many other buses, and inspect still many more. So many buses with character, with style and – no doubt – wonderful stories to tell. First stop was Ironbridge to see, yes, an iron bridge. 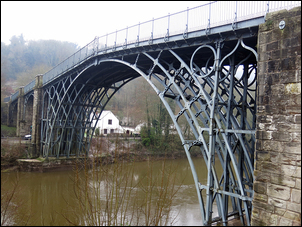 But not just any old bridge: this was the first bridge in the world constructed of cast iron. Built in 1779, the bridge was cast locally - for this area was once the technological leader of the world in iron production and casting. It was here that iron was first made using coke (rather than charcoal), a change that freed iron producers from a dependence on forests. The bridge, still in use for pedestrians, is arched and elegant. The town – that grew as a direct result of the crossing of the river created by the bridge – is a lovey little place. 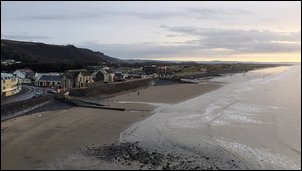 Rather like the experience we had at another UK bridge – the Firth of Forth – the adjacent town was, on this early winter morning, completely devoid of tourists. Following the signs, we then made our way to a museum that covered the history of iron production at this location. The museum was excellent, with some wonderful examples of castings and wooden patterns. 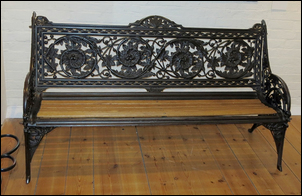 Most of the castings were more for household than industrial use – there were seats, stoves, ornate ceiling roses, fire grates and sculptures. The only problem with visiting a museum devoted to iron smelting and casting is that the gift shop acquisitions tend to be rather heavy… lucky that we now have a hire car! From Manchester, we ducked across to the RAF museum at Cosford. Three years ago, we went to the sister museum at Duxford - and were just blown away by the quality and size of the exhibits. Since then we have been to the Smithsonian museums of flight in Washington DC (and I don’t think that any aero or space museum can beat those) but even in that company, the Duxford museum remained excellent. And the Cosford museum? Some really significant exhibits, but all a bit jammed together, making it hard to see the aircraft as individual machines. So while I can now say I’ve seen – in the same hall – a Vulcan, Victor and Valiant, in reality I don’t have a clear picture in my mind as to how these aircraft compared in appearance. 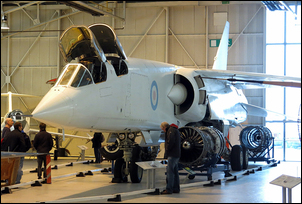 But the British Aircraft Corporation’s TSR2 prototype is a stunning looking aircraft – much bigger than I had pictured it, and more modern in appearance than you would expect from its 1964 date. Also at Cosford, the display of aircraft engines and, oddly, German WWII missiles, were both fantastic. From there we shot down to Birmingham to visit the ThinkTank museum. Rather like the Manchester Museum of Science and Industry, we were unsure from the website how good this museum would prove to be – but again, it was excellent. We already knew that one exhibit would make attendance worthwhile – the Land Speed Record Mobil Railton Special driven by John Cobb. The car set the Land Speed Record in 1938 with a speed of 353.30 mph – and then returned after the war in 1947 to set a stunning 394.19 mph. We’d decided that we’d spend that night in Bedford, about 150 kilometres from Birmingham – no big deal with good freeways that flow well. Well, that once flowed well! The traffic this trip to the UK is vastly greater than it was three years ago, and, with the Jaguar’s rather poor navigation system, what was going to be an easy trip turned into an hour-after-hour nightmare in gridlocked traffic. Next: Seeing Cardington’s wonderful 1930s airship sheds, and wrapping-up the trip. Tiny, quiet settlement in winter. Museum of Speed open only in summer. Wonderfully evocative expanse of sand. Interesting social, technological and transport histories covered very well. All are free! Full day for both museums plus walk around city dock areas. Worth also walking into city to look at architecture. Excellent display of stationary engines and weaving looms; good history of technology. 2 hours. Lots of buses! 1 hour. Fascinating insight into first uses of iron in industrial, civil engineering and domestic use. 3 hours. Too cramped! But some fascinating aircraft, engines and missiles. (If tight for time, go to Duxford instead.) 2-3 hours. Fantastic John Cobb Land Speed Record Mobil Railton Special car, other good exhibits. 2 hours.